This home on Trout lake is truly one of a kind! Experience lake front living at its best. A few of our favorite home features are the Great Room Basalt Stone gas fireplace flanked by walls of windows to showcase the outstanding views! Other unique features include the Master bedroom on the main floor, A full kitchen on the lower level, mature landscaping and a super quaint guest cottage. 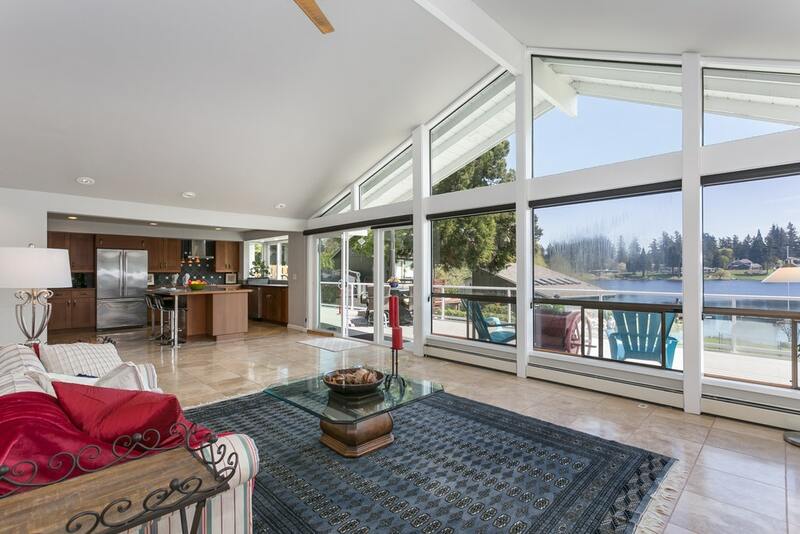 ​The home sits on 88’ of Trout Lake waterfront, imagine your morning coffee on the large deck overlooking the lake, with enough space to entertain your entire family! The home is sprinkled with custom materials throughout. This is a must see! We look forward to seeing you at our open houses this weekend. Cindy, what a stunning property, what do you love most about it? 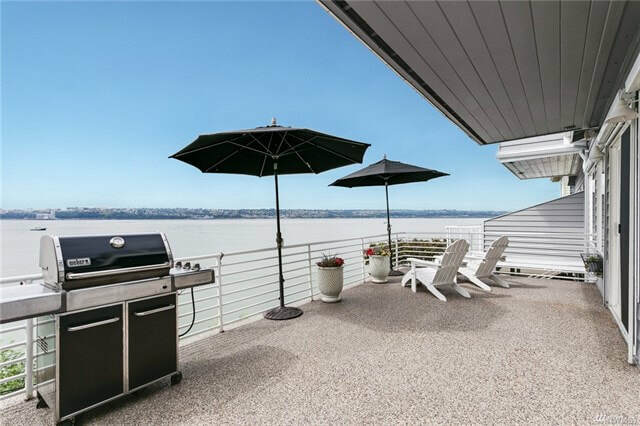 It’s a lovely, private location with sweeping views of Commencement Bay, Tacoma and the evening lights! The open floor plan is ideal for maximizing views while maintaining an ease of entertaining. It’s a perfect place to live worry free. There is already a great group of homeowners that you can be as involved with as you wish. The view certainly is captivating, but overall, what would you say makes this property so unique? The three levels of luxury living with views on every level and an oversized three car garage. Additionally, this end unit offers a courtyard with private walkway leading around to back of the property. You could even have a mother-in-law in this unit! What can you tell us about waterfront in this area and Browns Point in general? Commencement Bay features infinitely interesting yacht and shipping traffic that comes in and out of the Port of Tacoma. The public beach is just a half mile away with a community club and boat launch. You can join and take part in their fun activities year round that include an Easter Egg hunt, fishing derby and a great salmon bake every other year. On July 4th you have a front row seat for the Tacoma fireworks! The Browns Point community has restaurants, a dry cleaner, hair salon and a convenience grocery store all within walking distance of the AnchoRidge townhouse. If one had a day off here is beautiful Browns Point, what might they fill it with? One might visit the Brown Point Light House which offers community waterfront access and tour the Historic Center. During the summer, sunbathers and picnickers can enjoy the beach; relax and watch the sailboats, walk on the beach, fish from the shore and enjoy the magnificent sunsets! Speaking of this particular townhouse, what is your favorite feature? 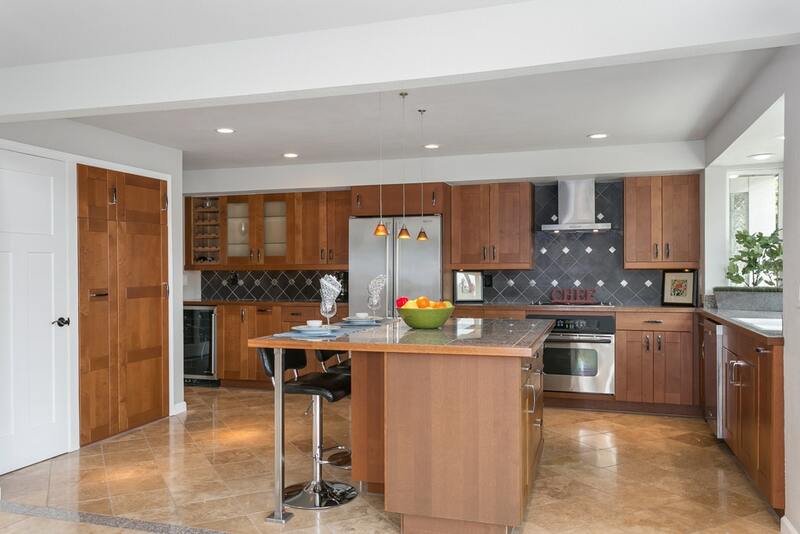 Definitely its one-of-a-kind floorplan, upper level utility room, kitchenette and wine cellar on the lower level, a 5-piece Master suite plus a junior suite on upper level. The high end finishes throughout really give the home a feeling of luxury. What advice would you give to a client looking to list a home in the area? Check out our tips in our blog on how to prepare your home to list. If you have a view home, I would suggest maximizing the views. Cindy, is there anything else that you would like us to ask you or to add? This property features a fully furnished clubhouse with fireplace, kitchen, space for parties and meetings, bathrooms have showers and a there is a dry sauna. The solar heated pool has chaise lounges, tables, chairs and umbrellas. It is perfect for water aerobics, exercising, lounging and meeting friends! You can even use the space to host parties. Also, the AchorRidge HOA is AMAZING! They cover all the common areas with professional landscaping, painting and maintenance of the exterior of the units. The HOA covers insurance, basic cable, water, sewer, garbage and recycling. Finally, pest control service inspections are 4 times yearly. Don't miss this incredible listing!